If you are in hurry to buy Jiophone at 501, then you must know these 10 points before buying Jiophone on Monsoon Hangama Offer. Guys don’t get excited about JioPhone, Because it, not a phone made for every user, but if you using feature phone till now and not yet bought a smartphone than this is the semi-smartphone for you and this is right time to upgrade from old feature phone to new JioPhone which has several smart features and trending application like WhatsApp, Facebook, Google Maps and other Google Apps. Wheather you know this features its good, but there so many terms and condition will be applicable while buying JioPhone1, its good to Know all term and Condition before Buying Jiophone1 on Monsoon Hangama Offer. Jiophone1 is not sold only Rs 501 in the exchange offer, But you to make compulsory recharge of RS 594 as a total of Rs 1,095, includes 500MB data per day and unlimited voice call and SMS valid up to 6 Months. In the exchange offer, you don’t get JioPhone2 with an exchange of JioPhone1, But will get JioPhone1 with an exchange any of your other feature phone and with the security deposit of Rs 501. JioPhone2 will be sold for its official Price 2,999. There is no need for the bill of your old phone and no box is required, but the old phone wouldn’t be blacklisted in a police case, which means stollen Phone is not allowed. Your old which is bought before 2015 and started using before 2015 are ineligible for the exchange offer. 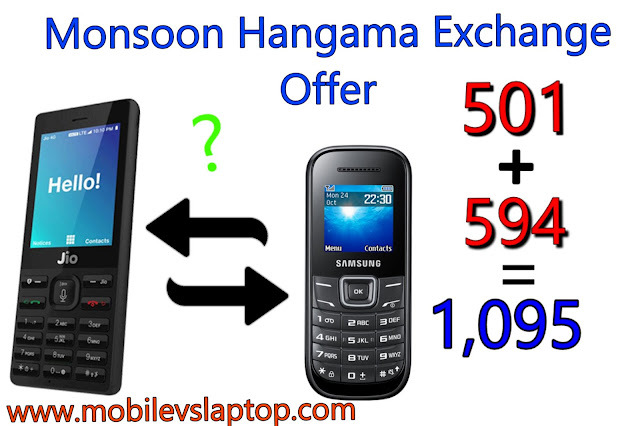 If your phone bought before 2015 and started using after 2015 is eligible for Monsoon Hangama Exchange Offer. Rs 501 is only refundable when you recharge for 4,500 next 3 years with same Jio Number, if you change the number in your JioPhone1 and use randomly you won’t get any refunds. this is the same case when you buy JioPhone1 for Rs 1,500. The refundable amount is valid only when you recharge for Rs 4,500 and you have to compulsorily maintain the original Bill, Box, and Other Accessories. These are the 08 Important and useful points to know before buying JioPhone1 for Rs 501. you can exchange the phone and get new JioPhone1 at your nearest Jio Store or Jio Retailer, Also book the online appointment on Jio.com and register mobile number that the Jio Executive can call you and Provide JioPhone1 at your doorstep. In this article, you came to know 08 important doubt on Jio Monsoon Hangama Exchange Offer if you find this article useful then don’t forget share across social media and if you have any doubts feel free to Comment below.